NHL fans aren’t the only ones bummed out about the ongoing lockout — the powers that be in the beer world are also hurting during these puckless times. 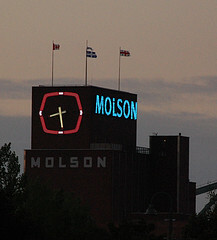 Molson Coors Brewing is in the midst of a sale slump that can only be attributed to the lack of fans gathering at homes and beers and toasting their favorite teams up in Canada. The Wall Street Journal says while the ice is quiet, so are the TVs in Canada where hockey is basically worshiped nationwide. Without fans cheering at bars, on their couches or in the stands at the rink, Molson is suddenly bereft of its customer base. The company’s CEO says there’s nothing else to be done without the core NHL beer drinkers, even if it tried to market its beer toward other sports fans. That means no sales surge until the NHL and the players can work out their difference and shake hands on a Zamboni machine. If Canadians are anything like American sports fans, it won’t just be the beer industry that slows down. Whenever there’s a lockout in the NFL, snack companies, chicken wing purveyors and the makers of other foods popular with fans watching the games get nervous about losing their captive audience. Of course,we fans are deprived of our beloved sporting events to boot during these frozen periods. So here’s to ending the NHL lockout. We’ll drink to that.